When the power goes out, what do you do first? If it was dark outside, I’d first grab the flashlights from the kitchen drawer and then call the power company on my cell to report the outage. Then I’d sit there and wait. I’d be hoping that the power wouldn’t be out too long. I’d be worried about the food in my fridge going bad and the house getting too cold (if it was winter). It’s stressful! I live in an area where we seem to have a lot of power outages for reasons I don’t know. It can be a bright, sunny day with not a cloud in the sky and the power will go out. If there is a storm outside, it’s pretty much a given that our power will go out. We also had construction down the road and they hit a line and knocked out power to my street. Many different scenarios can cause them. I’m a worrier so I anticipate these outages and wonder what I will do if they are out for an extended period of time. Am I ready for that? I wasn’t before, but I am now. I’m now the proud owner of a Champion 3000W/4000W Generator. I’ve never owned a generator before, but have friends who have them and say they are worth getting. It’s like owning peace of mind. If the power is out, you can use your generator to turn on the essentials in your home. The last power outage we had before I got the generator, my phone was almost dead. I had to go out in the driveway, turn the vehicle on and plug in my phone to the USB port to charge. What a pain! I figured it would be my luck that I’d have a dead phone right when our power goes out. Power outages are inconvenient, but they also can be dangerous putting your property at risk. Like I mentioned, if your sump pump has no power, what will you do if water starts coming in the basement? We had a ton of snow last winter and as it melted it started pouring into the basement, but my sump pump took care of it. Had we lost power, I don’t know what I’d do. I’m glad I have the generator now so I won’t have to worry about that. The Champion 3000W/4000W generator that I have can power an RV – great for camping. I don’t own a trailer so my main use for it would be during power outages at home. It’s powered by gasoline so make sure your gas can in your garage has some. We normally have gas in ours for the lawn mower and snow blower. My favourite features are the fact that it runs for hours and has an easy pull recoil start. Most of our power outages are never more than a few hours so it’s good to know that the generator will last throughout and that I can start it easily if John isn’t home. So where you can buy one like mine? Easy answer. Visit your local Canadian Tire store and pick one up for $599.99. They also sell them at Costco and TSC across Canada. It’s a bit of an investment, but can you really put a price on your peace of mind? To me, it’s worth every penny. 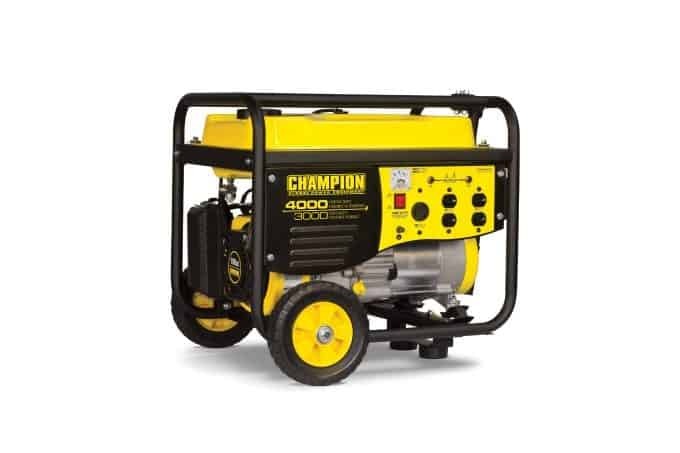 Champion Power Equipment is the market leader in power generators. The have a handy generator selector on their site so you can find a generator that is a fit for your family’s needs. Prices range from $299 to $1,100, depending on which one you buy. I also recommend taking note of the safety items when using a generator. One important thing to mention is to NEVER use your generator indoors. 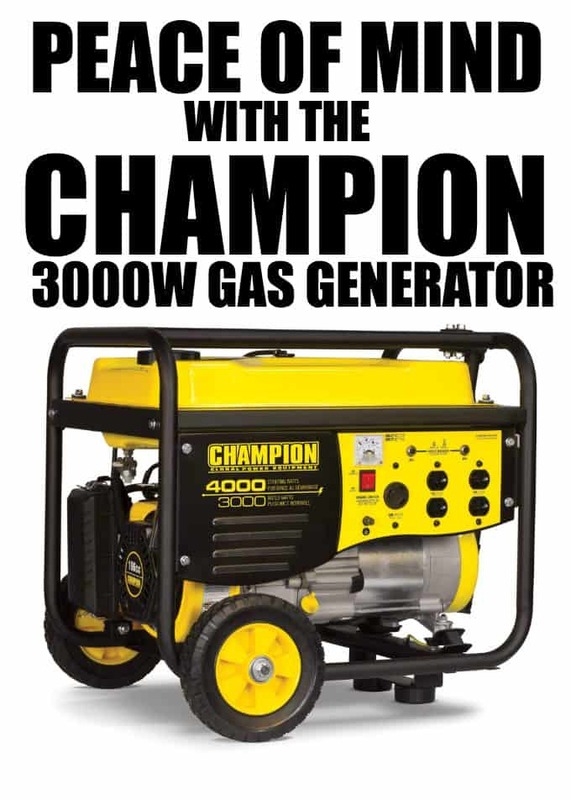 Visit Champion Power Equipment to learn more about their generators and other products. I’ve mentioned my reasons for owning a Champion generator. What are some of yours? Disclosure: I received product as compensation for this post. All opinions are my own. It would be great to have a generator in case of a power outage. 2 years ago we lost power for 4 days. Lost a lot of food.